Unless my depth perception is fucked, that doesn’t look impossible. 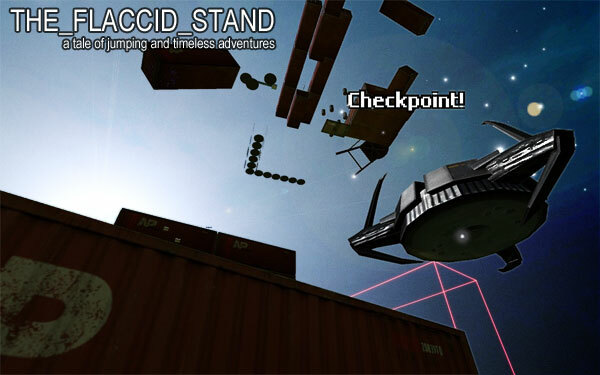 Jump to the clocks then on top of the transparent clocks, then over to the checkpoint. Of course, if the transparent clocks aren’t solid, then yes it’s impossible. The jump was possible but I added an invisible prop under the clock. If you tried jumping you would have landed on a shovel. Actually no because you weren’t standing on the right prop. You’re an idiot. I said that the jump was possible before I added the shovel, but thought it would be fairer if a supporting prop was present. There I made that part of the post more obvious. Remove it. All this level does is create drama because the second part has a non-jumping obstacle. the guns or the same part we talked about?